Not Allowed at the Pool Glass, alcohol, smoking and guns are not allowed in the pool area. Swim Attire Appropriate swim attire is required, which includes swim suits and swim shorts. Street clothes, cut-off pants, jeans, and loose tee shirts are not permitted in the pool. Swim Diapers Children who are not potty trained are required to wear an approved swim diaper. A disposal swim diaper may not be worn alone. Swim suits that provide a snug fit around a child's legs can be worn over a disposable swim diaper. A re-usable swim diaper can be worn alone or over a disposable swim diaper. Water Inflatable All users must be able to pass a swim test to use the water inflatable. 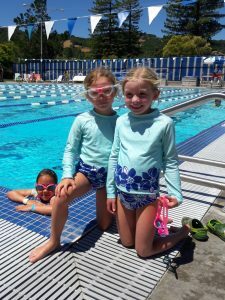 Shared space Classes/Programs may be going on during Lap/Public Swim Times. Lanes will be shared by different users. Please pay attention to signage and staff. Swim Tests A swim test is required for swimmers who want to use the water inflatable or swim in deep water. Test consists of swimming one length (25 yards) of the pool demonstrating comfort in the water, rotary breathing, and strong enough to swim the entire distance without stopping. Tot Pool The tot pool is open for non-swimmers under the age of 6. The tot pool opens earlier than public swim but again is only for non-swimmers. Swimmers 6 and older are not allowed in the tot pool. Adult supervision is required. Child Rest Period (CRP) A CRP is called on the hour, every hour starting the second hour of public swim. Children under the age of 16 are required to be out of the main pool during this time. Depending on weather and attendance, a CRP will be called based on the discretion of staff. The CRP is to encourage children to take a rest break and go potty. Please help ensure public safety by reminding children to use the bathrooms and to take a break from swimming. Parents with children 3 & under may use the pool during this time to work on water adjustment and swimming skills. A parent must be in the water with the child or the child will be asked to leave the water. Pool closure To ensure public safety, we may reduce attendance due to a shortage of staff or reaching maximum capacity. We staff the facility based on a guard to swimmer ratio. If it is a hot day or high attendance might be expected, please call ahead. Family Fun Days It's all about fun at the pool! Join us for fun themes, games and lots of family fun activities. Look for more information on your next visit to the pool! Family Fun Days are from 12-3pm and include Under the Sea, Western and the Around the World themes. Check back for 2017 dates. Vending Machines & Restaurants Snack, drink and ice cream vending machines are available in the pool. Across the street from the pool are different dining options including; Scotty's Market, Thai Kettle, Panchitos, LoCoco's Pizza, Sonora Taqueria, King of the Roll and Three Twins Ice Cream.